Sea-Tac Airport from the air, looking south. 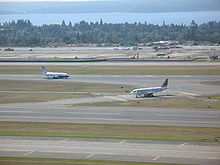 Bandara Internasional Seattle-Tacoma (IATA: SEA, ICAO: KSEA, FAA LID: SEA) (Bandara Sea-Tac) (/[unsupported input]ˈsiːtæk/) adalah bandara yang terletak di antara kota Seattle dan Tacoma, Washington, Amerika Serikat dengan kode IATA SEA dan kode ICAO KSEA. A view of the SeaTac Airport in September 2007, as construction of the new runway 16R/34L was underway. The runway opened in November 2008. An Alaska Air Cargo Boeing 737–400 freighter at SeaTac. The Alaska "Starliner 75th Anniversary" scheme on a 737–800 at SeaTac in 2009. ^ FAA Airport Master Record untuk SEA (Form 5010 PDF), effective July 5, 2007. 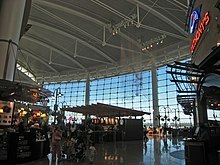 ^ "Seattle–Tacoma International Airport" (official site). ^ Cohen, Aubrey (May 30, 2012). "Alaska Air Launching Service to San Antonio". Seattle Post-Intelligencer. Diakses tanggal May 30, 2012. ^ (January 25, 2011). Horizon Air Retiring Its Public Brand and Adopting Alaska Airlines' Eskimo. Siaran pers. ^ "U.S. International Air Passenger and Freight Statistics Report". 2010. Diakses tanggal May 7, 2011. ^ "Seattle, WA: Seattle/Tacoma International (SEA)". Bureau of Transportation Statistics. July 3, 2012. Diakses tanggal July 3, 2012. HistoryLink.org Online Encyclopedia of Washington State History – Detailed articles on the history of the airport. Halaman ini terakhir diubah pada 24 November 2017, pukul 08.54.